Frontier Airlines continues to give Cleveland Hopkins International Airport a shot in the arm through expansion in the wake of United’s pull-down of its small hub in Ohio. Frontier plans to add three more destinations from Cleveland in Oct-2014, bringing its total cities served from the airport to 17. It is a rapid expansion for Frontier, which has quickly moved to backfill some of the capacity United is cutting from Cleveland, largely through increasing competition with its familiar rival rather than replacing lost service to smaller markets. Frontier’s ability to quickly spool-up Cleveland is made possible by the consolidating US airline market, and there should be ample opportunities for the newly minted ultra low-cost carrier (ULCC) to broaden its reach as legacy airlines focus on bolstering their fortress hubs to maximise revenue. During Oct-2014 Frontier is introducing service from Cleveland to Chicago O’Hare, New York LaGuardia and Washington Dulles. Those new routes will cap off a busy 2014 for Frontier in Cleveland. As United started slashing more than 60% of its daily departures in Jun-2014, Frontier is beginning to usher in new service to Atlanta, Fort Lauderdale, Fort Myers, Raleigh-Durham and Tampa. The latest crop of flights offered by Frontier from Cleveland beginning in Oct-2014 result in the airline’s presence at the airport growing to 17 destinations by YE2014 (based on announced service). In addition to the markets served above, Frontier also operates service from Cleveland to Dallas, Denver, Las Vegas, Orlando, Seattle, Trenton, Cancun and Punta Cana. Seasonal flights to Phoenix begin in Nov-2014. Once all the service is under way, Frontier will operate to six of Cleveland’s top 10 domestic markets based on seats deployed – Denver, Dallas, New York LaGuardia, Chicago O’Hare, Orlando and Atlanta. Frontier’s entry into those markets is similar to moves Spirit (the US’s original ULCC) has made during the past few years. Spirit’s domestic push has been from legacy airline strongholds (Dallas being the most obvious example) where it deems it can stimulate traffic from a base that has been priced out of the market. Spirit usually operates from those large metro areas to both larger markets and some smaller destinations, which in theory seems to create a nice mix of revenue. During 4Q2013, Cleveland was ranked ninth among the top 100 airports from highest to lowest fares, based on data from the US Department of Transportation (DoT). The airport’s average fare for that time period was USD458.53, a 0.6% drop from the year prior. Cleveland’s average fare during 4Q2013 (the latest timeframe available from the DoT) was roughly USD77.53 higher than the US domestic average of USD381 in 4Q2013. Cleveland’s higher fares, coupled with United’s downsizing at the airport are creating ripe opportunities for Frontier. However, Delta is also making some moves in Cleveland after United’s cutbacks. It has added flights to Indianapolis and Raleigh-Durham, two markets United exited. Delta is competing with Frontier on the new service to Raleigh-Durham, and the two carriers will also operate on service to LaGuardia once Frontier’s new flights begin. With the exception of Atlanta, Seattle and Punta Cana, Frontier competes with legacy airlines in its new markets from Cleveland, primarily United. It will be interesting to see if Delta moves to add flights to its hubs in Atlanta and Seattle from Cleveland. Seattle is of particular interest given that Delta is working to build connecting traffic in Seattle to its long-haul markets. One of the unique reasons that Frontier may find Cleveland so attractive in the wake of United’s cuts, is its ability to compete with United in Denver, a long-standing hub for both carriers. Frontier has vast knowledge of competing with United, so introducing service from another United hub is not a stretch. 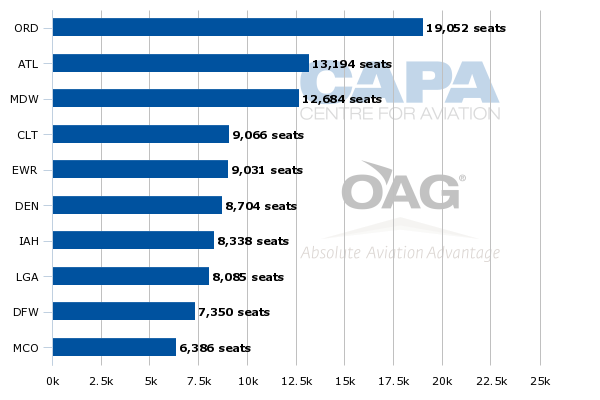 Even with its reductions in Cleveland, United remains the largest carrier in Cleveland by a wide margin – a 45% seat share for the week of 16-Jun-2014 to 22-Jun-2014 (based on CAPA and OAG data). Presumably, there is a lot of room for stimulation in the Cleveland market. Frontier is also rapidly expanding from another United hub – Washington Dulles International Airport – where United has a 65% seat share (16-Jun-2014 to 22-Jun-2014). In addition to the new Cleveland-Dulles service scheduled to begin in Oct-2014, Frontier, during Aug-2014, is adding service from Dulles to Atlanta, Charlotte, Chicago O’Hare, Cincinnati, Detroit, Fort Lauderdale, Fort Myers, Las Vegas, Memphis, Minneapolis, Orlando, St Augustine and St Louis. Frontier faces no competition on flights to Atlanta, Charlotte, Fort Myers, Memphis and St Augustine. It will compete with United on service to O’Hare; United and Delta on flights to Cincinnati; Delta on service to its hub in Detroit; JetBlue on service to Fort Lauderdale and Orlando (United also serves Orlando); United and Delta on flights to Minneapolis; and United on service to Las Vegas. United also operates on Frontier’s planned new Cleveland-Dulles pairing. Dulles is another market where Frontier has a viable opportunity to stimulate traffic. Its passenger growth was negative 2.7% year-on-year from CY2012 to CY2013. Dulles was also the third highest fare market in the US during 4Q2013 based on DoT data, which like Cleveland creates some traffic stimulation opportunities for Frontier. The distance between is Dulles and Washington National is roughly 45km; but for residents living west of Dulles, that airport is more convenient, especially if average fares fall to some of the airport’s most attractive markets. Is more service by Frontier in Cincinnati in the offing? With Frontier’s recent tabling of plans to further its expansion in Cleveland, the obvious question that arises is what other markets the carrier may be considering. During the past year Frontier has also added service from Cincinnati (a Delta hub where service has shrunk) to Denver and Trenton, New Jersey, a focus city for Frontier. The airline also operates flights from Cincinnati to Punta Cana. Recently officials from Cincinnati Northern Kentucky International Airport told local news publication The Cincinnati Enquirer that Frontier’s load factor on service to Denver was averaging 90%. 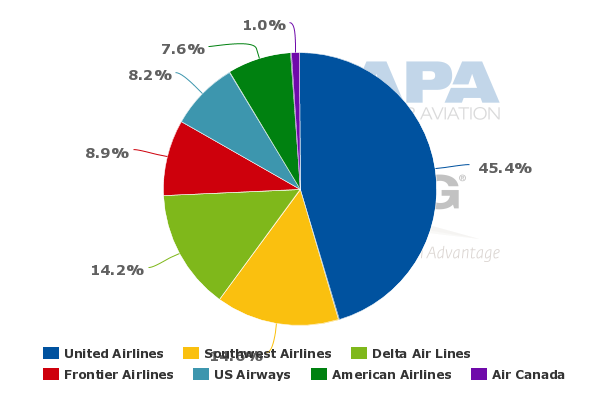 Delta, United and Frontier all serve that route, with Frontier representing a nearly 59% seat share compared with 26% at United and 16% for Delta (based on CAPA and OAG schedules for 16-Jun-2014 to 22-Jun-2014). Frontier’s higher seat concentration is a rarity as it offers less than daily service in many markets. But Denver is Frontier’s largest base by a wide margin, and given its presumably lower fares, Frontier can sustain the capacity it has on the route, evidenced by its reportedly high load factors. Given Frontier’s point-to-point business model, the 401km distance between Cincinnati and Cleveland should not prohibit the carrier from further expansion from Cincinnati. Frontier’s business model is not based on hub economics, so it could easily expand from Cincinnati into other markets, both large and small. Houston Intercontinental is another United hub that always features prominently in DoT’s highest fare airports. Frontier currently serves Denver from Houston, so there may be some opportunity for expansion at Houston. However, Spirit Airlines has also shown interest in Houston, serving O’Hare, Detroit, Denver, Los Angeles, Las Vegas and Minneapolis. For the moment it is likely Frontier is attempting to avoid as much direct competition with Spirit as possible to ensure the two ULCCs are not tripping over one another in certain markets, so Houston is likely not on Frontier’s radar. For the moment it seems as if Frontier is concentrating on mining opportunities in Cleveland, Dulles and perhaps Cincinnati. But as the new American optimises its network during the next couple of years there will no doubt be some refining of certain markets, even as executives of the airline have pledged that no dramatic cuts are necessary at American’s hubs. (Both United and Delta made similar pledges in the respective mergers with Continental and Northwest). Therefore, there could be some openings in Philadelphia and Phoenix for ultra low-cost carriers to execute their strategies. Frontier’s network evolution is certainly one of the more interesting developments within the US market place. It has had fits and starts during the last couple of years prior to its commitment to transition to an ULCC. With the business model change almost complete, its presumed low costs should open up new markets the legacy airlines are no longer chasing. Its latest moves in Cincinnati and Washington Dulles could be just the beginning of a domestic push similar to ULCC pioneer Spirit.